Fixed ridgeline: takes the guesswork out of setting the sag. 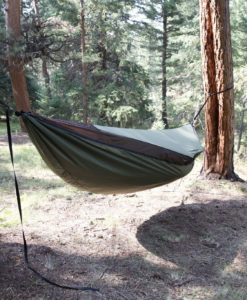 Ridgeline storage stuffsac attaches to the hammock’s ridgeline for convenient storage space. Continuous Loops: This option is not a useable suspension by itself. It comes only with small Amsteel loops on the end of the hammock that act as anchor points for the attachment of just about any suspension type. Webbing w/Buckles: This is a popular suspension option, it includes a pair of 12′ polyester straps with simple to use buckles, it is intended to be used with a pair of carabiners. Easy to use and adjust, almost no learning curve. -Suspension weight: 6.7oz, one pair of Warbonnet carabiners: 1.75oz. Whoopies w/Dynaweave Straps: Standard 6′ Amsteel whoopie slings hitched directly to the end of your hammock, and 6′ Dynaweave tree straps (loop at each end). Our Dynaweave webbing is made from UHMWPE fiber which has the highest strength to weight ratio of any synthetic fiber available, the result is a full strength webbing that is much thinner and compact at 1/3 the weight of standard polyester webbing. -Suspension weight: 2.35oz, One pair of Warbonnet FishHooks: 6g. Becket Suspension: Our longest suspension option (and lightest per foot), with 6′ of extra reach compared to our Buckle or Whoopie suspensions. Hammock comes with Amsteel continuous loops hitched on the ends and a pair of 15′ Dynaweave straps (loop at one end). -Suspension weight: 2.5oz, One pair of Warbonnet FishHooks: 6g. Note: The weight ratings listed below are based on comfort, not absolute tensile strength. So for instance the single layer is rated for a max of 250 lbs because users above that weight will experience more stretch than is ideal and so would be more comfortable in something with more support (like the Heavyweight double). The comfort ratings can be pushed somewhat but you will be trading in comfort in doing so. Single Layer Traveler XL 11ft. Lightweight Double Traveler XL 11ft. Heavyweight Double Traveler XL 11ft. Listed weights include stuffsac and ridgeline but not suspension. The ridgeline on my hammock is too loose or too tight, how do I fix this? You loosen the ridgeline by loosening the hammock suspension and you tighten the ridgeline by tightening the hammock suspension. The ridgeline should be neither super tight nor drooping, and this will be achieved when your suspension straps run at about a 30 deg angle. Tightening/loosening the suspension will also raise/lower the hammock, so you may need to raise/lower the straps on the tree trunk to dial in the final hammock height which should be about chair height. What is the difference between the lightweight and heavyweight fabric? This refers to the weight of the fabric only, the heavyweight fabric being a heavier, stronger, more durable fabric than the lightweight fabric. It does not refer to the weight or weight capacity of the hammock itself.&nbsp; For instance a single layer 1.7 is made of the heavier more durable fabric, but since it is a single layer it is lighter than the lightweight double layer. 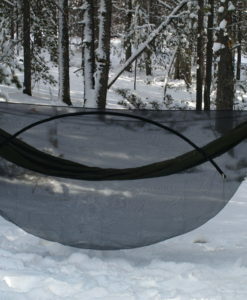 So single layer vs. double layer has as much effect on hammock weight and weight capacity as fabric type does. All weight capacity and product weight info is listed in the collapsible product details boxes to the right of the product description. For more information on which one is right for you, see our hammocking 101 page. What is the largest pad that will fit in your hammocks? Generally any standard-sized backpacking pad (20″ or 25″ width) will work regardless of thickness and length, but in general the largest commercial camping pad that will be appropriate will be the size of the Exped downmat 9 LW, which is aprox. 77″x25″x3.5″; Also keep in mind that in a hammock you need insulation only, no padding is needed so extra thick air mattresses are not necessary; R-value and warmth are what are really important. Also keep in mind that if you are considering buying a new pad to use with one of our end-gathered hammocks (like the Blackbird or XLC), that an underquilt will be much more comfortable and a lot less hassle so you should seriously consider putting that money towards an underquilt instead. How do I know which model of hammock is right for me? We have several different hammock models each having different features, a breakdown of the differences can be found partway down our Hammock 101 page. What is included/not included with the hammock? All of our hammocks come with the stuff sack included and your choice of suspension. 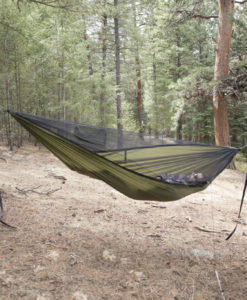 Recommended items are listed on each hammock page. I just got my Traveler a few weeks ago and had a chance to get it out for the first time this past weekend… I gotta say this thing is AWESOME!! This is my first purchase of Warbonnet Gear but will not be my last… in fact, I’ve already ordered the MountainFly Tarp and it’s arriving tomorrow! I went with the buckle suspension and I love how easy it is to adjust the hammock. Will need to get used to having the webbing ATTACHED o the hammock itself but the benefits and ease of use is pretty awesome. Most of the time I’m camping off my motorcycle so weight isn’t a huge issue but if I were backpacking with it I’d likely swap it for the Whoopie Sling… which is ANOTHER nice feature of this gear. Lots of options! Love this Hammock and I’ve been really impressed with the regular communication I’ve gotten when I had questions. Great product and fantastic service… you won’t be disappointed! I’ve never left an online review for anything I’ve ever purchased in my entire life, but after using the Traveler XL on several trips I feel the need to voice my praise for this product and the Warbonnet team. I picked up a Traveler and Mamajamba tarp as my first backpacking hammock set-up after doing hours of research and comparisons, and am extremely satisfied with my decision. I knew I had a quality product as soon as I opened the box, but after a recent backcountry group trip where I had the chance to see the Traveler side-by-side with other comparable brands, it’s clear Warbonnet is the best out there. I’m a big dude (6”2, ~220 lbs. 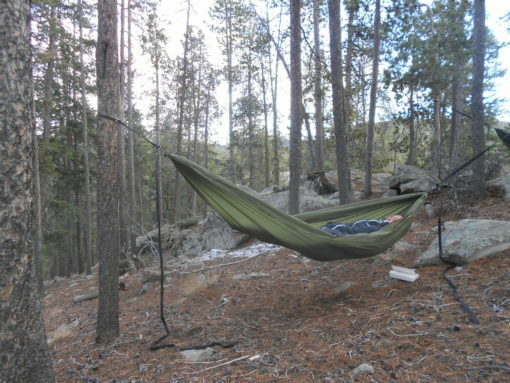 ), and I have *never* been more comfortable sleeping in the backcountry than in this hammock, even when I was younger and my back was more resilient. I decided to leave a review during that most-recent trip when I woke up in a pre-dawn downpour, realized how dry and comfortable I was, smiled, and went back to sleep. If you’re on the fence, look no further – this is an exceptionally well-made piece of gear worth every penny. My only regret is not getting one sooner. I have had my traveler for 3 years now and have spent many nights in it. By far, it is my go-to hammock and I can always count on getting a good nights sleep. Pair the hammock (with whoopie slings) up with the dutch gear poly-pro / dynema straps and toggles and your choice of span distances is incredible. Easy set up, light weight and comfortable. This hammock is exactly what it says it is, no frills but top quality design at a great price. The width is more than ample for a flat diagonal lay (I’m 5’4″ and 135 pounds). The ridgeline makes setup extremely easy and eliminates any guesswork for getting the right hang. It is my 4th hammock and my favorite hands down, and it came at a better price than I paid for others vs quality and satisfaction. I use the Kammock Dragonfly bug net and it fits well, especially since the ridge line eliminates the need to tie out another line for protection against the creepy crawlies. This hammock is simple done well, I absolutely recommend it for newbies and seasoned hangers alike. You won’t be disappointed. Amazingly comfortable hammock and easy to set up. Absolutely love it. This hammock is finely crafted and looks to be made with extreme care to every detail. I set it up to see how it hangs and was very impressed. I am happy with the hammock, but I wish WB had a strap like the Python, or Atlas. That is the only minor quibble. No need to look further, this hammock is the best out there if you don’t want an attached net. I have the XL 3 ounce model in yellow. Will be my go to summer hammock to throw in my KTMs saddle bags. I also have a 1.7 double which is my favorite any season backpacking hammock. Lighter and better for me than other brands I have used. I was looking at the Blackbird, but I didn’t need the net and wanted something more simple, so I went with the traveler. A lot of my friends have ENO and Grand Trunk hammocks, and this is way more comfortable, easier to set up, and more durable. I highly recommend the hammock. So now I own a second traveler , 2 bug nets and a superfly. Ordered the double layer 1.1 traveler on July 5th, it arrived on the 8th, very fast. 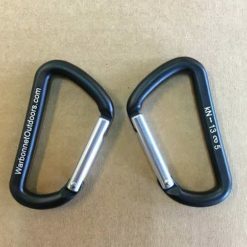 Product seems well made, is very light, easy to set up with whoopies and additionally purchased carabiners. The straps were a nice feature, larger than competitors stock straps. Good stuff sack, too. It opens at both ends and with a hammock this light it’s just as good as snakes. The stuff sack does fit a small asymmetric tarp with the hammock but it’s kind of a messy stuff. Plenty of room in the sack, might be better if it was a longer and narrower instead of the current width and length but I’m happy with it. Slept two nights in it this weekend, it’s comfortable. I appreciate the fact that there are two openings, one at each end, to easily insert and adjust a closed cell pad. Can’t give it 5 stars as I’ve only had it for less than a week but it seems good, will probably come back an update the review in a few months. This is my first hammock, and I’m a convert. I was sleeping on a camping air mattress in my apartment before I installed the hardware to hang this indoors. I’ve slept in this for four nights, and I love it. I agree with others who say that hammocks largely reduce pressure points. The only time I wake up now is to use the bathroom, where on a regular bed I usually toss and turn several times a night to relieve pressure points. I love it. I bought the Traveler with the double fabric. the fabric has a stitched slot where you can insert your pad. I’ve used both a foam pad and an air mattress and I’ve slept well on both. I chose this hammock because I don’t want mosquito netting once the temps cool off, and I want the double fabric for summer when it’s too warm to use an underquilt. I’m really happy I made the move to hammocks, and very pleased with my Traveler. Also, the whoopie slings are super cool. Very light and easy to adjust once you get the hang of it. Can’t wait to use it outside! I recently took my Traveler out for a 4 night overlanding trip. We set up in various campsites in both parks and on trail and the hammock performed at each. One night it was set up with barely enough webbing between two huge trees, and the next there was barely room for the hammock. On both occasions it was easy hang and adjust. This was also the first time I’ve spent a night, let alone 4 consecutive ones, in a hammock without any soreness or waking up to switch positions. I used a Klymit Static V in the hammock and outside of adjusted it after I got in the hammock I essentially laid down and didn’t move until morning. The traveler definitely opens up some possibilities for me in the way of hammock camping. I can’t wait to take it out bike camping this weekend. I’ve been looking at hammocks to get for a couple months now and finally decided on the Warbonnet 3.0 traveler. It’s a great entry level hammock, easy set up with the webbing and buckles. Warbonnet makes really quality products. Just a great hammock. No frills. Worth every penny. Good construction. Comfortable. Easy setup right out of the bag. Great customer service. Buy from Warbonnet without worry. I just purchased a traveler single layer 1.7 for use on day hikes. I was confident it would be a great buy and it is. I purchased a blackbird double layer 1.1 and the edge tarp couple years ago. Haven’t slept in a tent since. If you’re an ultra light trekker or just want a comfortable hammock than look no further. Warbonnet is the best of the best when it comes to hanging. I have been using a hammock for a while now. I started out with the commercially available ones from REI, like all newbies do. Then went to the ones on Amazon (Kammock), thinking I was “In the Know”,but I wasn’t. I was still lost, in the maze of hammocks available. I finally saw the light when I was introduced by a friend to his WarBonnet hammock. What I didn’t realize is how truly uncomfortable all those other hammocks were, until I used a Traveler. WOW, just WOW. I am 6′ 1″ tall, I weigh 240 lbs, and have to say, the comfort provided here by WarBonnet is second to none. I can now say I am the proud owner of my very own Traveler. I used it less than 48 hours after the equipment arrived at my door step. If you are reading this, do yourselves a favor and make the purchase. You will sleep better. You will be more comfortable. You will show up to your camping adventure looking like you are in the know. And you will make all your friends jealous of your superior intellect and rugged good looks. Ok, maybe not that last one, but 4 out of 5 isn’t bad…right? Though I am not new to hammocks I am new to Warbonnet and very pleased with the quality. 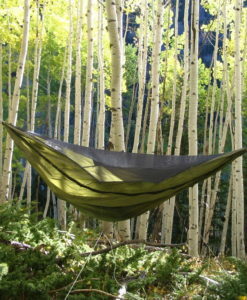 I was looking for a simple, no frills hammock for day hikes and the occasional overnight trip. I opted for the traveler for its simplicity and could not be more satisfied. The build quality is excellent and in my opinion one of the most comfortable hammocks I have used. I have already ordered the Edge tarp to accompany the traveler and can already foresee a blackbird and superfly on the horizon. Just got the double layered Traveler a week ago. So far I love it! It has great construction and quality material. Super easy to set up and has a comfortable lay. I’ve been using it in my backyard all week, but can’t wait to take it out in the woods and spend a couple nights in it this weekend. This is my fourth Traveller Hammock I have bought. I use all 4 of them in different places. One hangs in my living room. One in my bedroom, one in my daughter’s room for her to sleep in and lounge around, and one is in my backpack when I go hiking. (along with my Warbonnet Superfly.) I love the design, the light weight and more than anything else– THE SLEEP!!! Full time hammocker. The sewing and fabric choices are first rate. It’s the careful design, details, and material selections that seperate Warbonnet from the others and make this such a comfortable hammock. New to hammock camping but well versed in UL gear/philosophy. Went with a traveller 1.1 DL over one that a friend gave me for Christmas to get me on my way to hanging. The set-up is simple with the ridgeline and straps. My xtherm fits nicely between the layers and is surprisingly warm. I don’t think I’ll be sleeping in puddles again here in PNW and highly recommend this hammock to UL’ers thinking about hammocks. I’m not sure what makes this particular hammock so comfortable but I have never been so comfortable in any of my hammocks. This is definitely going to be my home hammock from now on. Now to save for a blackbird. The Ridge Runner hammock performed better than and other hammock I’ve ever used. Best sleep ever and no back pain! Unless I buy another Warbonnet Hammock it will be the only one I ever use. My sleeping pad stayed in placed and with my Supperfly Tarp I stayed high and dry in 6 nights on the trail. I’ve just started hammock camping and I purchased the superfly and the traveler hammock. Both of these products are very well made. I’ve set them up using the knots and methods outlined in the videos. I couldnt be happier. cant wait to test them out on more than a backyard overnight. I’m making plans believe me. I’m psyched about this new setup and will be using it in the coming winter here in western NY. Thanks for a great quality US product! Quick shipping too. Ordered mine on sunday and recieved it on Saturday. thanks! I’m so happy I took a chance on this product. This is my 4th hammock, and my second Warbonnet product. I purchased this Traveler XL with a custom 1.7 double layer. It is extremely comfortable. This hammock has replaced my bed, and I’ve been sleeping in it nightly for about 2 weeks now. Since I’m indoors, I put a fleece blanket between the layers and I’m very comfortable at night. It was 56 outside last night, and I’ve not turned the heater on in the house yet. I highly recommend the Warbonnet product lines. My Traveler, Blackbird, and Superfly are very well made. Though I’m no expert, I can see the better craftsmanship in these products. It is clear that Brandon takes pride in his work. I foresee more products for both camping and home sleeping in the future. After much research on line, forums and backpacking friends, I bought the Warbonnet traveler. It was my intent to test this hammock and see if this is the kind of camping I want to do. I was amazed at how well this simple traveler hammock is constructed! I’m a big Dude as well so doubling up on material for the 1.7 was a good move! There is a reason many folks who hammock camp or just enjoy hammocking choose a Warbonnet. You won’t regret one dine you spend on these high quality cradles of Love! Thanks Warbonnet!!! I love this hammock. Ample room to stretch out and get comfy. Such a great night’s sleep! I ordered the 1.1 Double and it is really nice to be able to slide my Thermarest pad between the layers to stop it from shifting underneath me all night. If I had it to do over again I would order the 1.7 Double just for the added weight versatility but I am in no way dissatisfied with the 1.1. Plus, given the price, this is a great way to get into hanging without breaking the bank. Happy Hanging! Easy to set up. Comfortable. Like the ridge line. Can hang small stuff on it while sleeping. I am large 6’3″ 250 lbs. It is long enough but would like to see a wider version so in weather I could cover up with the sides. Maybe a foot. Well made. Happy with my purchase. I have several hammocks, including a double-wide. I am tall, but most of them, I have come to realize, are too short, and none have had double bottoms. The length of the Ridgerunner means that I can sleep nearly flat, and I don’t slide out. The double bottom keeps the pad from curling and sliding. I slept better in the Ridgerunner than any hammock I’ve owned, let alone in a tent on the ground. Plus the structural ridge line and the buckle suspension is fast fast and easy. Mosquitoes don’t factor after dark where I hike (the Sierras), but if things change, there may be a Blackbird in my future. I am glad I found out about Warbonnet. Much thanks for a fine product.